Angels over Lyon | Meg Davis, Ph.D.
overeating, it’s unbeatable. Even if you don’t want to fork over your life savings for a meal by Bocuse or one of his proteges, you can easily get a plate of local mushrooms cooked by people who mean it. In Lyon, walk down the street from the train station for a bit and you’ll get smacked in the face by a view of the river or the Basilica, hovering gold on a hill top in the night sky. At night, the streets fill with young people hopping the bars and arguing about whatever it is they study at the local university. And on Sunday morning you can fill a suitcase with the haul from the market: cheese, andouille sausage, blood-red cherries, an apple tart, a bottle of local wine, all enough to make the TGV work to cross the hills with you, back to Geneva. This weekend, we met some favorite relations in Lyon to see Zingaro: an equestrian theater troupe unique to France. Headed by an impresario named Bartabas, the troupe of 10 performers live in trailers together and work around the clock with a couple dozen horses. The horses gallop, and the performers, dressed as angels, stand on the galloping horses, and then leap up into the air, touching on the ground side to side of the racing horses, and then flying up again. Sometimes the performers wing high over the horses, touching on them, and then sail across the circle to land on a different horse. The horses just keep right on going. One of these performers is my nephew, Mathias Lyon, who combines elegant hip-hop dance moves with gravity-defying acrobatic flight. Every time he galloped off the stage, I could hear my sister, sitting beside me in the darkness, exhale with relief. That’s Mat’s back on the web page, under a wing. The show will be touring for a while, but if you’re interested, best to pull some heavenly strings as it’s selling out quickly. 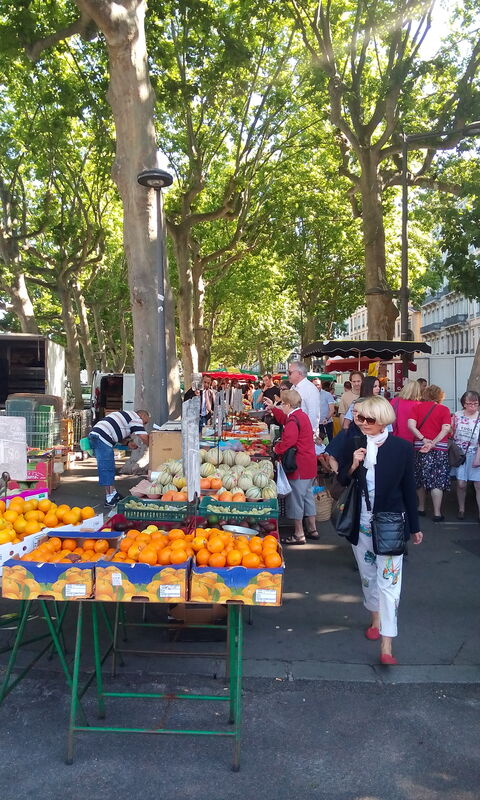 This entry was posted in Travel and tagged France, Lyon, travel. Bookmark the permalink.